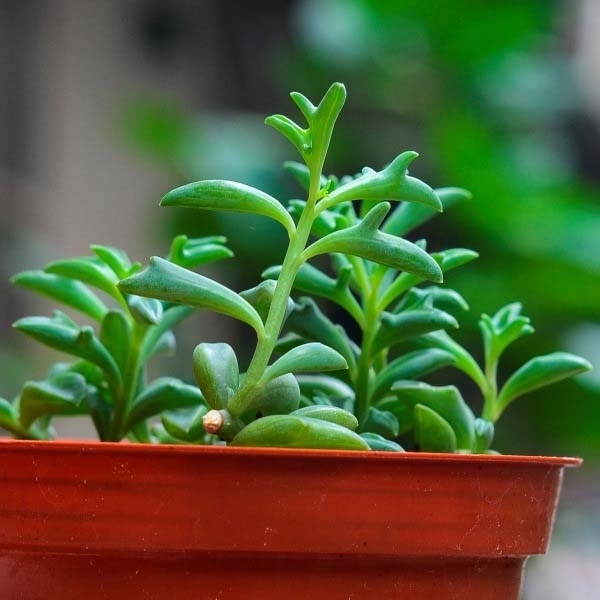 Delightful, easy-care plant with foliage that resembles a frolicking pod of tiny dolphins. The stems emerge upright and then gradually arch over to trail down the container. Under ideal conditions may produce small pink flowers. Also known as: dolphin necklace, dolphin plant, jumping dolphins, and flying dolphins. The ideal location is somewhere the foliage can be allowed to cascade, such as in a hanging basket, macrame hanger, or on a plant stand. The perfect plant for a sunny windowsill. Can be placed outdoors in warm months or frost-free regions. Apply a balanced liquid fertilizer monthly during periods of active growth. Allow soil to dry between thorough waterings. Water approximately once a week if plant is in a bright location. Potting mix designed for cacti and succulents. Plant in well drained soil, fertilize regularly. Tolerates drought, but looks best with regular watering.